Congrats! I love that dog Dancing Spur! Tough grounds like that is why you want that high white tail too. That's a lot of hoofing to do Dennis, I thought you normally participated in horseback trials? Great video to help others understand what pointing dog trialing is all about. Thank you. I really enjoyed that video ! Well done. What a terrific piece of ground to hunt a dog over but it did look very difficult to keep in touch with the dog among all that cover. Can you tell me how long that run was time-wise ? In Britain we very seldom get more than about 15 -20 minutes to find game in. Nice video...I swore the judge said Dancing Sperm! Nice Video ...Would have loved that BBQ . Looks like good folks on a good day . I wonder how much Game was Missed on all that lovely ground ?..probably never know . I am old fashioned , but why the judges have to be on horse back ,and the Handler doing the singing ?..If they can see more than the handler then perhaps they have an advantage on what they see, rather than what or how the dog is being worked with the Team mate ... To find and flush and shoot and retrieve that game . I would love a day in that country with a dog or two . Trekmoor wrote: I really enjoyed that video ! Well done. In this championship each brace of dogs run for one hour. One hour gives the judges a solid look at performance, conditioning, style, handling, etc. You are right "it's very difficult to keep in touch with the dog among all the cover" We train for the dogs to keep track of us handlers. If the dogs point birds, and keep track of us there is a chance we can finish with an opportunity of a placement. Sharon wrote: Congrats! I love that dog Dancing Spur! Tough grounds like that is why you want that high white tail too. Great video to help others understand what trialing is all about. Thank you. Thanks for the compliment! I was very impressed with this trial in 2016 and 2017 after helping judge it both years. I had as much enjoyment participating in this trial as any horseback trial, mainly because of the unique cover its run on. I'd defiantly recommend walking trials as much as horseback. If I didn't have horses, I'd be walking all the time. polmaise wrote: Nice Video ...Would have loved that BBQ . We also have trials where the handler is on horseback too Polmaise. Many people though don't have a horse ,or don't want to ride, so walking trials are popular and keep the trial participant numbers strong. Championship woodcock trial in New Brunswick in a couple weeks. New Brunswick isn't that far from Scotland. "If they can see more than the handler then perhaps they have an advantage on what they see" Having the judges on horseback does give them the advantage of what they see at this trial. I'm not sure how anyone could find "seeing more from horseback" a problem? I hope I understand your question correctly? Our trials do not include shoot to retrieve, it's more like catch and release! This trial is held on wild sharp tail. We also find or see, turkey, woodcock, ruffed grouse, deer and wolves. Skydance wrote: In this championship each brace of dogs run for one hour. One hour gives the judges a solid look at performance, conditioning, style, handling, etc. You are right "it's very difficult to keep in touch with the dog among all the cover" We train for the dogs to keep track of us handlers. If the dogs point birds, and keep track of us there is a chance we can finish with an opportunity of a placement. Thanks Skydance . I never seen a Brace Run in the clip . Sorry if I missed that . Skydance wrote: "If they can see more than the handler then perhaps they have an advantage on what they see" Having the judges on horseback does give them the advantage of what they see at this trial. I'm not sure how anyone could find "seeing more from horseback" a problem? I hope I understand your question correctly? Our trials do not include shoot to retrieve, it's more like catch and release! This trial is held on wild sharp tail. We also find or see, turkey, woodcock, ruffed grouse, deer and wolves. Yea , Thanks for that . "Release and catch " Is not best practice in our parts ,but I can see how it would produce a show for a Test/Trial . ..Wolves would be good to see ..On a point ? Any videos of that Trial . Thanks in advance . Very grateful . In this championship run my brace mate was picked up early in the trial for not backing Spur while on point. The only time you see the brace mate is on the breakaway. The idea of a trial dog is not to find all the game. Too much time and energy searching every bush. 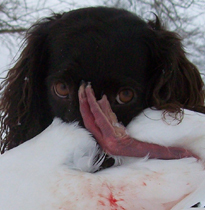 The dogs learn to identify cover likely to hold birds called objectives and cast out to those objectives. A trial is about driving your Ferrari as fast and hard as it can go for 30, 60, or 90 minutes and trying to hold on. Hopefully by the end of the race your still in the car. The guy can drive the fastest and look the best while doing it, wins. In Britain no game is shot during pointer/setter trials , just a shot fired to "salute" the departing birds following a point. Game, both feathered and furred (rabbits and hares) is shot in our H.P.R. (hunt - point - retrieve) trials for the versatile breeds. The dogs have to be steady to flush, to shot and to fall of game and then retrieve it on command. If they do not do these things they are eliminated. If a dog misses a covey or a bird in any of our pointing trials it will be eliminated. To be honest I don't understand how a dog in the video could "run to an objective" bird holding or otherwise. The whole hunting ground was one huge bird holding objective and a dog's view of the various cover patches would be even less than that of a man on foot. I am certain that if a trial for pointing dogs took place in Britain over land with that amount of cover , the dogs would have been expected to considerably cut back on their normal ranges in order to try to find every bird for if a bird got up behind the dogs "beat" then the dog would have been eliminated. That would apply in both our pointer/setter trials and our H.P.R. trials. I'm not trying to knock the way you lads do things, just pointing out the differing expectations. How I wish we had horseback trials in Britain ! I can hardly walk 40 yards now without stopping to gasp for air but I could still sit on a cuddy just fine ! Anyway thanks again for the video, I found it very enjoyable. The dogs learn through experience what holds birds and what doesnt. Its hard to tell in video but im sure the dog was pointing in bluffs of cover. Your right though birds could be everywhere and the dogs need to be on their game. This is the beauty of a wild bird trial vs a liberated or throw down trial. Those wild birds sort out the dogs really quick. RyanDoolittle wrote: The idea of a trial dog is not to find all the game. Too much time and energy searching every bush. The dogs learn to identify cover likely to hold birds called objectives and cast out to those objectives. However wild birds is what develops dogs, its the training that turns them into trials dog. Dogs are taught to run edges and cast out to bluffs. They are developed to run as hard as they can, as fast as they can, and as far as they can without loosing touch for 30, 60, 90 minutes or whatever the game you decide to play calls for. Yes you take dogs from the exact same litter, put them in the hands of hunters, and you have some best hunting dogs money can buy. I wont be drawn into another trial dog vs hunting dog debate with you again, I learned not to feed that troll a long time ago. That will be the last thing I say to you in this thread. Thanks for that video.... one of the best I have ever seen. That's what I call a fun day out ! Sharon, before Robt. asks, and apropos of Bill's kudos for the video above, can you please clarify that there ain't no "sangin'" by the handlers to their dogs at the upcoming N.B. woodcock trial - or if there is, it's "limited" to a recording of Stompin' Tom Connors belting out his posthumous release "Let the Timberdoodle Special Shine Its Everlovin' Long Beak on Me!" You had me for a minute. Sangin is a town in Afghanistan , but I think you meant " singing". Then I got it ; very funny. I wish Stompin' Tom was still around. I see a collar with antenna on the dog. GPS only? Ecollar and GPS? Apparently one or both allowed in the trial? averageguy wrote: I see a collar with antenna on the dog. GPS only? Ecollar and GPS? Apparently one or both allowed in the trial? GPS only, ecollars are not allowed. Certain GPS collars are not allowed as well. Sharon wrote: You had me for a minute. Sangin is a town in Afghanistan , but I think you meant " singing". Then I got it ; very funny. I wish Stompin' Tom was still around. Interesting for sure !! ? Is the American Woodcock Really the size of a Robin ??? as in the article . I thought all things "Merican" were Bigger ?...> Our Woodcock are 10 x the size of a Robin ..
Perhaps our Robins are Small ? I'd say fatter than a robin , but same length and of course that long bill makes the woodcock look bigger. That thing about the size of American woodcock made me think the size stated must be a mistake too. As Polmaise says our woodcock are many times larger than a robin.....unless you have huge robins ! A robin is smaller than a snipe , the smallest of our British gamebirds and I always feel a bit sorry whenever I shoot a snipe …. it's just a wee dicky-bird ! I've just googled searched the size of British robins ...they are only 12 -14 cms in length. Your dicky birds are bigger than ours ! Ye'd huv me in jail, you bleeper ! I liked both Videos posted "Skydance" . Thank You . Different or In-different is Not a dislike nor a condemnation or declaration. Horses for courses . GPS is for dog retrieval purposes only. Once you use the gps, the dog is out of consideration. Weekend trials judges largely let handler keep receiver, turned off, in their possession, many championships the judge has receivers in their possession. A video from a Handlers View can be so Different .Much like any Judge No matter the country or even Trial or Test . I had this 16 month old "HPR" out today ..and had a Lovely time ,so did the dog ...In Training . Nightmare ..If Some want to Judge something they see regarding rules . Every day is a learning day ...For a dog . Every day In a Test /Trial ..Is the same for a Judge ..or those who train for the rules in competitions. Thanks for all the good compliments and comments, and shared video. I'm using the old school Marshall Telemetry for recovery. I've chosen Marshall telemetry over GPS. My experience with telemetry vs GPS has always been solid recovery, no lost signals. I like the capabilities of GPS as a training device, not as a long range recovery device. In many ways. - sorry, I couldn't resist. I much preferred the film clip from "Only Fools and Horses" --- the one in which Batman and Robin come charging out of their Reliant Robin to do battle with the baddies . That scene was one of the funniest things I've ever seen ! Betcha oor Haggis's are bigger than your's though ! You guys are onto some good ideas, keep it going! Who's the next challenger? Trekmoor wrote: Betcha oor Haggis's are bigger than your's though ! I don't know anything about your Haggises, but this is the only kind I'm familiar with.